This flower-like sculptural piece is composed of a hand-selected gradient of mussel shells. Artist Valerie Carmet transforms the childlike wonder of collecting seashells at the beach into sophisticated works of art. This piece is made of scores of ocean-cleaned mussel shells, collected along the coast from the Rockaways to Cape Cod. The artist then carefully assembles selected shells into a flower-like composition that's part collage, part mosaic, and part sculpture. 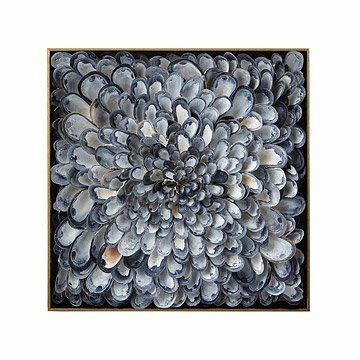 It's mounted in an elegant, floating metal frame which provides compelling contrast to the organic and infinitely varied forms of the shells. It makes distinctive decor for an ocean-lover's office, beach house, or any space that could benefit from the allure of the sea. The piece comes individually signed and numbered by the artist. Handmade in New York. Dust clean with a feather duster.